The NEW IntelliBot SwingoBot 2000 Robotic 28in disc auto scrubber/drier offers Hands-Free Robotic Automatic Floor Scrubbing at the touch of a button to increase productivity, improve cleaning consistency, and reduce cleaning costs in your facility. This highly versatile robotic autoscrubber may be mapped* for use in a wide range of Education / University, Retail, Office, Warehouse, Manufacturing, Airport, Arena, Gymnasium... environments. To find out about mapping the SwingoBot for your facility call Dobmeier directly at 1.800.870.2006. 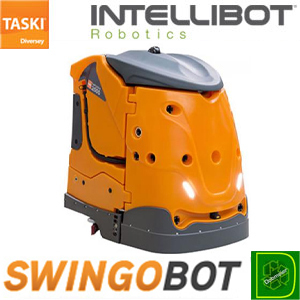 TASKI INTELLIBOT SWINGOBOT 2000 IS NOW AVAILABLE WITH BEST AVAILABLE DISCOUNT PRICING FROM DOBMEIER - CALL 1.800.870.2006! SwingoBots can work multiple cleaning shifts without interruption. The optional battery exchange kit (TASKI-1100059) allows the operator to exchange tired batteries for fresh in just a few minutes, completely avoiding any down time for the robot to recharge. Each maintenance-free battery pack provides up to 4 hours run time. A single operator can easily manage multiple SwingoBot units to multiply productivity severalfold. SwingoBots feature a large touchscreen control panel with icon-based menu that eliminates language barriers and makes operation easy. Interactive menus and on-line, multi-lingual help screens guide the operator through various functions and cleaning options including Route, Area, Spot, and Manual modes. Custom-mapped cleaning routes are stored in memory for rapid selection. Prior to starting, each operator provides a password code that prevents unauthorized use and identifies the operator for performance reporting. SwingoBot features Intellibot's G-10 technology, that uses 14 sensors to give the robot a 360-degree view of its environment, so it can operate and clean autonomously. It will automatically navigate around objects, avoid stairs, and come to a safe stop if someone inadvertently steps into its path. The easily accessed emergency stop button can immediately halt the robot, safeguarding people and equipment. And front and rear signal lights flash to notify people when it is stopping or turning. SwingoBot provides a 28in Scrubbing width from dual, counter-rotating, pads or brushes that rotate at 200rpm and have a head cleaning pressure of 94lbs. The robot can accommodate various abrasive grades of pads and brushes to suit your floor surface. SwingoBots are compatible with most eco-friendly cleaning solutions and can even work in complete darkness so you can turn off the lights to save energy. Additionally, environmental impact and cleaning costs are significantly reduced by the advanced 4-stage purification system that filters water to one micron, providing clean, reusable water and eliminating wastewater and chemicals by 85% - saving 1,000's of gallons of water and associated cleaning chemicals annually. The optional UV light sterilization process destroys 99.99 percent of harmful microorganisms, and is effective against both Cryptosporidium and Giardia. Noise pollution and personal distraction is minimized by quiet operation with 65dBA noise rating. The SwingoBot's front door allows easy access to the brush head and other components (e.g. fuse box, circuit breaker, etc). The tank and lid design allow easy access to all filters and to the tank for daily maintenance or cleaning. Bag, filters and the brush head are also easily accessible, as are the integrated drain hose with drain valve. Batteries are quickly interchangeable when using the optional Battery Exchange Kit. SwingoBots are equipped with Wi-Fi and 3G communications to enable on-demand performance reporting and remote diagnostics. Reports show the machine location, operator identity, running times and dates, and any maintenance issues. On-board diagnostics constantly monitor all major systems to self-diagnose problems or routine maintenance needs so that the robot can alert the operator or Intellibot service staff when required. Intellibot technicians can remotely diagnose and remediate problems, significantly reducing downtime and service call expense. Dobmeier Janitorial Supplies, New York - Official IntelliBot Distributor. We ship Janitorial Floorcare Equipment, Accessories, Parts, and Supplies Anywhere in North America. For Best Available Discount Pricing Call: 1.800.870.2006.